Scary Terry's World: Sunday Sunday! Today is a first for me -- not only my first Rex Morgan Sunday page -- but the first time I've had two Sunday strips in the paper! So here are today's Rex and Phantom strips. I have to wonder if there is any newspaper out there that runs both...? As I've noted previously, now that the Comics Kingdom site is showing the full "half page" strips, I don't feel the need to post all my strips here anymore -- but I will from time to time -- especially if I've saved some work in progress shots to share, or have a story to tell that relates to the strip. 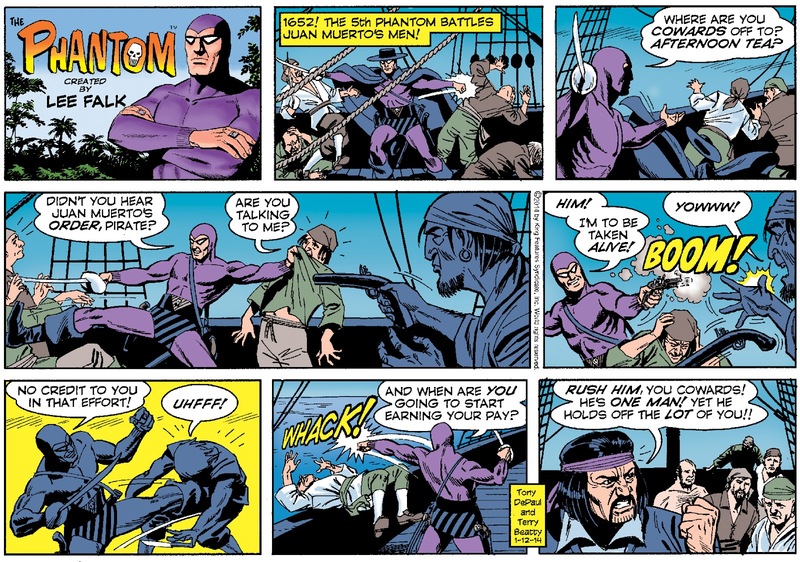 Today's strips certainly show the contrast between the features -- Rex is a pretty low key conversation in the office-- while The Phantom is an action packed fight scene on a pirate ship! I'm still working on Jungle Tales of Tarzan pages today -- Martin Powell and I are adapting Edgar Rice Burroughs' story, The Lion, for a graphic novel to be published by Dark Horse. Back to drawing the strips tomorrow. Great Sunday Rex. Nice use of perspective. Really liked the action-packed Phantom. I was kind of surprised to read in one of your earlier entries that you had to start Rex cold so to speak. Do you have a separate schedule for working on the Sundays or do you just work in order? can you share the curernt story (of The Phantom) before doing what you wrote above ? Jim -- the Sundays are due several weeks before the dailies -- but the goal is to draw the strip in chronological order -- and be ahead enough on schedule with the dailies to do so. Anonymous: The full Sundays are available on Comics Kingdom -- no real need for me to post them here. it is just a matter of size; of getting a whole story with the same size.